Posted on January 28, 2017 by Edge Leisure	in Newsfeed and tagged Edge Leisure. If you’re a regular reader, you’ll know all about Infinity Pools by now. In fact, if you’ve not read our recent post about the greatest Infinity Edge pools the world has to offer, go and do it now. Go on. It’s fine, we can wait. Done? Good. Now, it will undoubtedly come as no surprise to you to learn that the deftly, creative hands of the swimming pool builders here at Edge Leisure are capable of far more than simply your bog-standard swimming pool, and the luxurious looking Infinity alternatives. Oh yes, our talented and dexterous (and not forgetting modest) team can build you almost anything you can dream (within reason) and one of the pools you may opt for is the deck-level pool! Lower that eyebrow dear reader, your probable inquisition is about to be thoroughly resolved! So first of all, what does a deck-level pool do differently to an Infinity Pool? 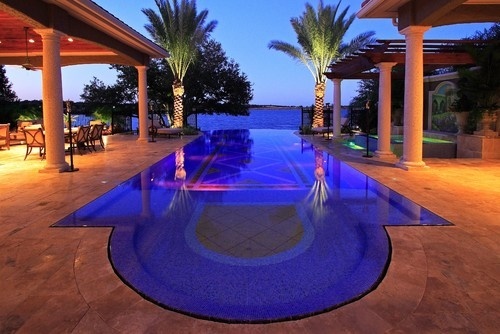 Essentially, whereas the latter allows water to consistently overrun one or more sides of the pool, a deck-level system has the water within the pool at exactly the same height as the surround. Similar to the Infinity alternative, water that inevitably spills over is caught by an overflow tank, allowing it to then circulate back through the filtration system and into the pool. This means levelling and height must be absolutely pinpoint-precise during the build, and once completed it creates a stunningly beautiful, clean and interesting visual edging. One of the deck-level system’s main advantages, other than its stark aesthetical splendour, is the manner in which it renews the water more often than standard pools, thus ensuring it is cleaner for a larger percentage of time. Similarly, this type of pool allows teachers to get in nearer to their students making for a more intimate lesson, though it does make teaching diving a little trickier. This however, can be combated by raising one of the edges to a recommended 30mm above the water level. Now a hugely popular alternative to the norm, deck-level pools were once the reserve of the gym or school. With an increase in presence in the home throughout the UK, they can create a truly awe-inspiring visual – perhaps ideal for you! Give us at Edge Leisure a call today to find out more!